To make kitchen design your own – no easy task. 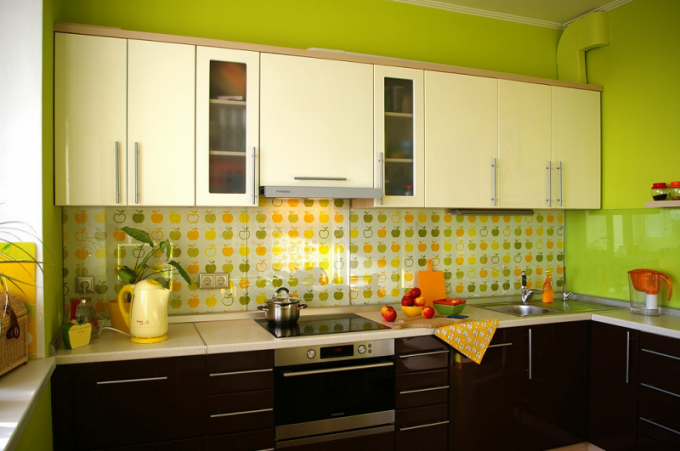 Because it is not only the choice of color and style to the updated kitchen. But, first and foremost, ergonomic space planning, selection of materials and choice of lighting. Any project should start with creating a plan. Draw it on paper with the exact layout and dimensions of all parameters (walls, doors, Windows). Determine where you will have a working area, and where dining. It is simple to do when the kitchen area is sufficient – more than 10 sq. m. And with standard areas of "Khrushchev" and "brezhnevok" – 6-9 sq. m. will have to fight for every inch. So let's see what are the niches, corners and sill can functionally use in the room. Planning the work area, do not forget about the so-called work triangle: sink, Desk, storage products. The movement from one point of the triangle to the other you don't interfere, and through him must not pass the line of movement of people in the apartment. Then work in the kitchen will be comfortable. Lighting of the working area is also a very important point in a design project. It is best to create additional lighting of working spaces using led lamps or halogen lamps. Dining area should be separate from the work. The main thing – to create comfort and convenience. A sufficient number of seats for the whole family, a good approach to the area during the serving of dishes, good but not glaring light. In advance, make a list of all household appliances and equipment that you want to see in the new kitchen. Headsets you can buy, especially if you have a large area. Or order by an individual project, adapting it to your space and specific needs. The second option is particularly advantageous for small apartments. Built-in washing machine and fridge can make the whole space more and more spacious. Dining area in small apartment it is possible to replace the bar. Especially if you young family. Another option is a folding table. It may not be the most comfortable solution, but for small kitchens it is sometimes the only opportunity to eat in the kitchen with the whole family. The choice of materials is another cornerstone of the design project. Today the construction market offers so many different finishes to choose becomes harder and harder. For flooring is the perfect tile for the work area and laminate flooring high-class for the rest of the kitchen space. You can use linoleum – this material is still in demand due to its versatility, ease of installation and reasonable prices. The choice of kitchen aprons may just confound: ceramic tile, terrazzo, plastic panels, artificial stone, tempered glass, MDF, etc. it Remains only to choose what will suit you in quality, design and price. The style of your kitchen is the final phase of the project. The most important thing – to see the kitchen in its design conformed to the decision of the apartments. If your interior is standard and does not carry any style of the line, and the kitchen should not draw in distinct design direction. For large and spacious kitchens are great massive and intricate headset classic or modern. But for small spaces it is best to choose furniture and accessories in the style of minimalism or hi-tech with smooth planes and simple lines so as not to overwhelm the already small space.